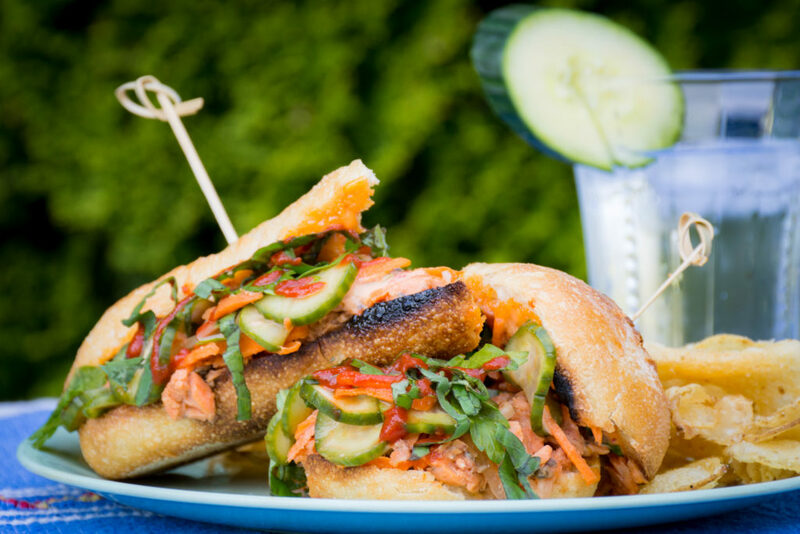 "Bahn Mi" sandwiches are a delicious and trendy Vietnamese style street food. Traditionally made with a pork pate; we made ours with an Asian inspired canned salmon salad. These are great for picnics and other functions! Slightly warm baguette in oven without toasting. Cut in half and evenly spread mayo on both sides of baguette. Top with Salmon salad, cucumbers, carrots and Cilantro. Cut baguette into quarters with two quarters making one large sandwich that can easily be shared. ***One can easily adapt this and most sandwich recipes to be "paleo" or low-carb friendly by replacing the bread with a collared wrap seen in the photo. This can be done by removing the thickest part of the 'trunk' of the collared and blanching the leaf in boiling water to soften it. It can then be filled with all of your favorite sandwich fillings and wrapped like a tortilla. Combine all ingredients in a small bowl and stir until thoroughly combined. Place Cucumbers and onions in a small bowl in an even layer. Whisk together all other ingredients and pour over vegetables. Cover and refrigerate for at least 1 hour. Whisk together in a small bowl; refrigerate after using. Hi there, thanks for your response! What other information are you looking for?